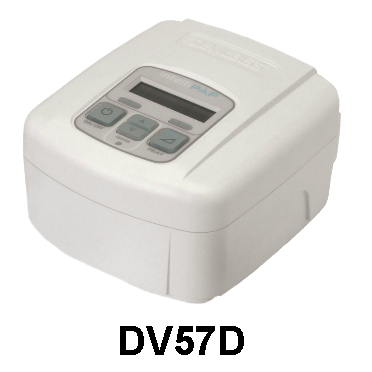 IntelliPAP AutoBiLevel CPAP Machine BUY DeVilbiss IntelliPAP, DeVilibiss AutoBiLevel, AutoBiLevel Machine, AutoBiLevel CPAP, DV57D, DV57D-S, DV57DHH, DV57DHH-S, IntelliPAP AutoBiLevel. IntelliPAP AutoBiLevel Standard Model - Each - SHIPS FREE! 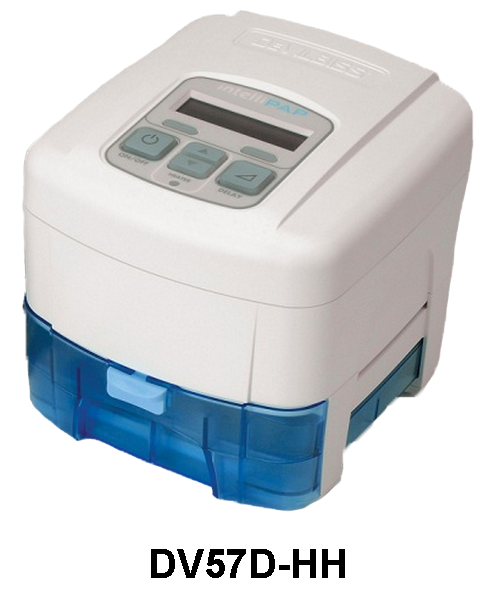 IntelliPAP AutoBiLevel with Heated Humidification - Each - SHIPS FREE! 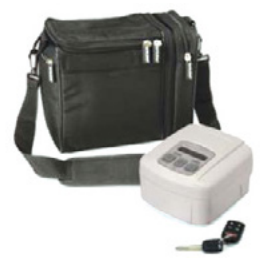 IntelliPAP AutoBiLevel with Heated Humidification, SmartLink Module & Data Card - Each - SHIPS FREE! IntelliPAP AutoBiLevel CPAP Machines combine the benefits of the AutoBiLevel and BiLevel technology to offer CPAP patients comfortable therapy even at higher pressures for severe Obstructive Sleep Apnea. The AutoBiLevel functions allow this CPAP Device to better mimic a patient's natural breathing pattern for ease of use and greater comfort. The IntelliPAP AutoBilevel offers three separate advanced functions as well as conventional CPAP. The advanced functions include AutoBiLevel, Standard Bilevel, and Auto Bilevel. This AutoBiLevel CPAP Device allows clinicians to adjust the apnea and hypopnea detection to your individual standards. The split-night feature allows you to measure activity through the first part of the night without pressure changes similar to single night lab study and titration. IntelliPAP AutoBiLevel CPAP Machines feature automatic adjustments to the CPAP user's pressure requirements. 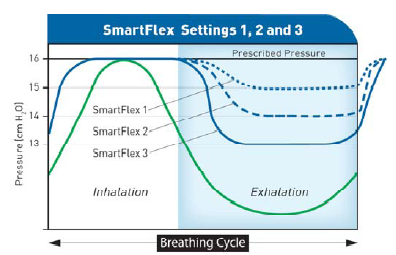 This pressure flow is auto-adjusted for both inhalation and exhalation. The IntelliPAP Auto BiLevel CPAP Machines use a unique AutoBiLevel algorithm that features event set measurement. 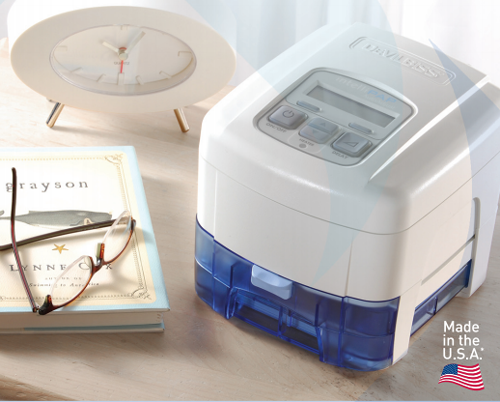 The AutoBiLevel IntelliPAP is designed for patients who require higher pressures to get sufficient oxygen to their lungs. This Respiratory Assist Device offers bilevel pressure without a backup rate feature. The AutoBiLevel CPAP Machines provide intermittent airway assistance with continuous positive airway pressure and are used with nasal masks or full face masks. 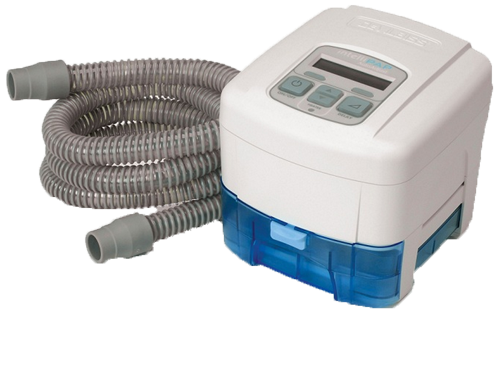 Manufactured by DeVilbiss, the IntelliPAP AutoBiLevel offers a pressure range of 3 to 25 cm H2O. The IntelliPAP AutoBiLevel may operate in conventional CPAP mode and AutoBiLevel mode. IntelliPAP CPAP AutoBiLevel offers Flow Rounding® technology. This important advanced CPAP technology provides more comfort for CPAP patients and allows adjustment of transitions in and out of IPAP and EPAP. This feature offers a more natural and comfortable breathing with independent IPAP and EPAP transitions. Additionally, DeVilbiss IntelliPAP AutoBiLevel CPAP Machines use SmartCode technology for remote data collection to measure efficacy and usage. IntelliPAP AutoBiLevel CPAP Standard Model - DV57D. IntelliPAP AutoBiLevel CPAP with SmartLink Module & Data Card - DV57DS. IntelliPAP AutoBiLevel CPAP with Heater Humidification - DV57DHH. IntelliPAP AutoBiLevel CPAP with Heater Humidification, SmartLink Module & Data Card - DV57DHHS. 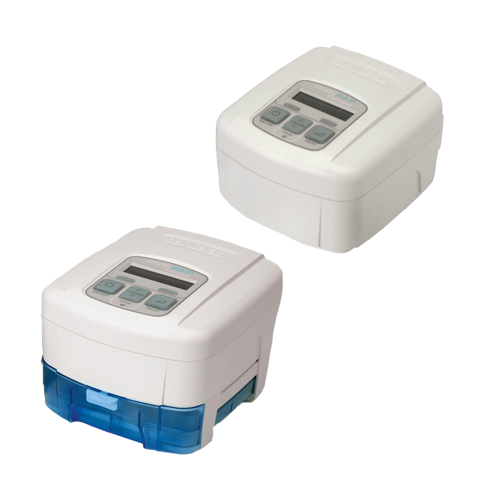 Provides flow rounding technology for more comfortable breathing. Offers auto-adjustment of flow pressures throughout the night to prevent patients from unintended waking up. May be operated in CPAP and Bilevel modes. Also provides an advanced AutoAdjust and Auto BiLevel modes. DeVilbiss IntelliPAP AutoBiLevel CPAP Product Numbers: DV57D, DV57D-HH, DV57D-HH-S, DV57D-S.
Pressure Settings: 3-25 H2O cm. Flow Rounding Pressure Transition Relief: Yes. Remote Compliance Data Retrieval: SmartCode. 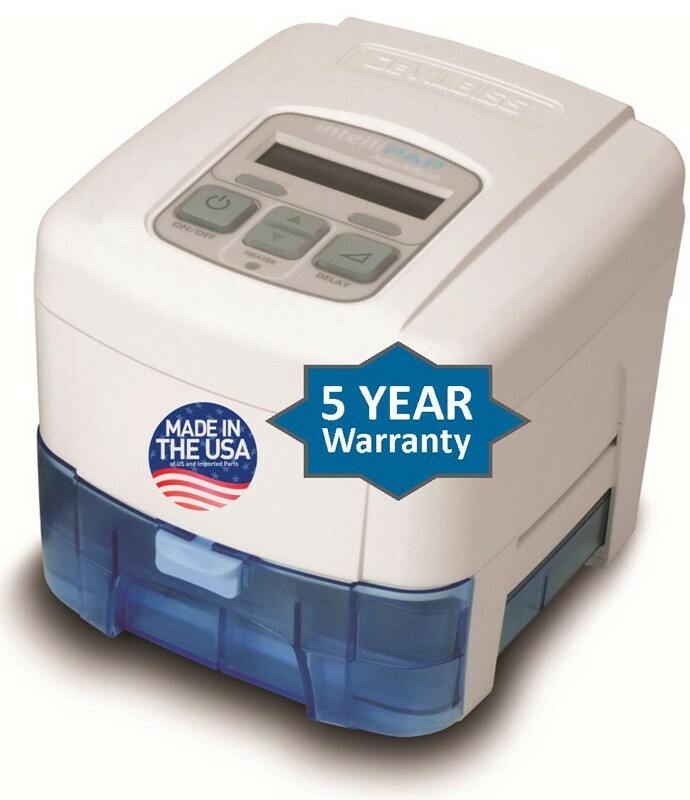 DeVilbiss IntelliPAP CPAP AutoBiLevel Warranty: 5-year warranty on IntelliPAP, 3-year warranty on heated humidification system, 3-month warranty on humidifier chamber. IntelliPAP AutoBiLevel Flyer provides information about the humidifier chamber, SmartCode, and design. IntelliPAP Overview discusses the quality of this CPAP device, flow rounding technology and compact size. DeVilbiss IntelliPAP AutoBiLevel DV57 Instruction Guide is provided in English, Spanish, and French. 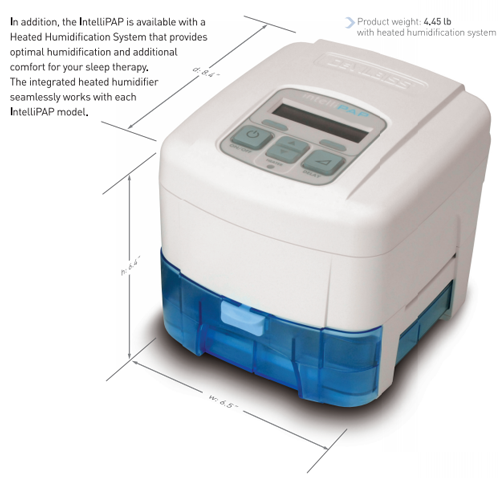 AutoBiLevel CPAP Humidifier Use and Care Instructions reviews operating and cleaning instructions. AutoBiLevel Accessories and Replacement Parts lists parts and part numbers for the DV57 Series Machines. IntelliPAP AutoBiLevel Warranty provides details of DeVilbiss' warranty information. AutoBiLevel CPAP Warranty FAQ answers the most often asked questions about the DeVilbiss warranties.